A long time ago, I accidentally put my needle between the next two stitches, pulled a loop through, and then knit the next stitch. That’s interesting, I thought, but it’s not what I need right now. Later, I played around with it a bit more. I might or might not end up using it in a design, but it’s well worth sharing anyway. I ended up finding the name for this kind of increase in Montse Stanley’s Knitter’s Handbook : loop increases, though she discusses them in the context of pulling a loop through a spot in your already knit fabric. I ended up liking this kind of effect better in any case (though you might decide differently). A key thing to remember about this kind of increase is that you should be very sure to pull enough yarn through that the fabric isn’t puckered (unless that’s the effect you want). The further away from the needle you pull the yarn through, the longer the float will be, and the more likely it will be to snag on things. Also, a loop like this doesn’t have to be an increase; you can knit it together with one of the stitches on your needle right away. Pick a stitch to be the center stitch of the feather. 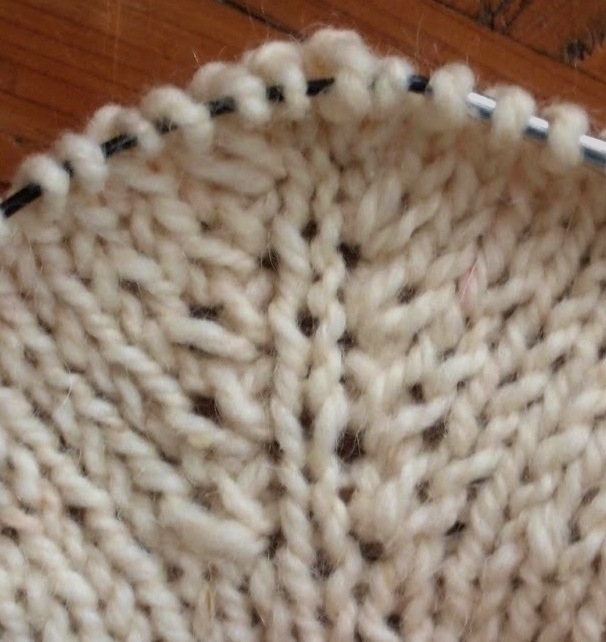 Knit up to one stitch away from the center stitch. Knit a stitch through the hole, leaving enough slack. Knit the next three stitches. Purl back (or knit the next round plain), then repeat the same maneuvers on the next round. I like the feathery effect this makes. Of double yarnovers and lark’s heads. Five different ways of working double yarnovers. but if you knit each loop the way you would a normal stitch, it won’t make two stitches, which is undesirable. Another technique I learned about more recently is to knit or purl through each loop, but to twist them as you go. (Double YO #3) This seems to be rather less well-known, and is a useful basis for Double YOs #4 and 5 above, so I’m going to write about it here. Then you can twist the loop and either knit or purl it. then slide it around under the yarn so that it’s behind the other needle. If you’re knitting it, it’s in the perfect spot to go ahead. If you’re purling, you’ll have to remove the needle and hold onto the slack with your other hand while bringing the needle in from behind. Once you’ve worked the first YO, work the second one the same way you did the first, so that both are knit or both are purled. Now that’s all very well and good, and is sometimes the best option, but it’s asymmetrical, and I’m often in favor of symmetry. 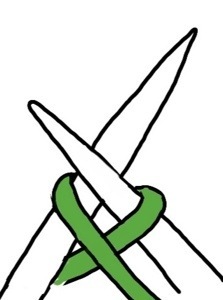 I was thinking about knots one day. 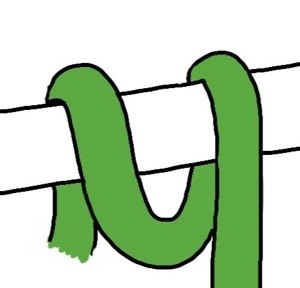 A twisted yarn over loop is basically the same as a half hitch. When I was a child, I was taught a knot that we called a whole hitch, but that is more commonly called a lark’s head knot. 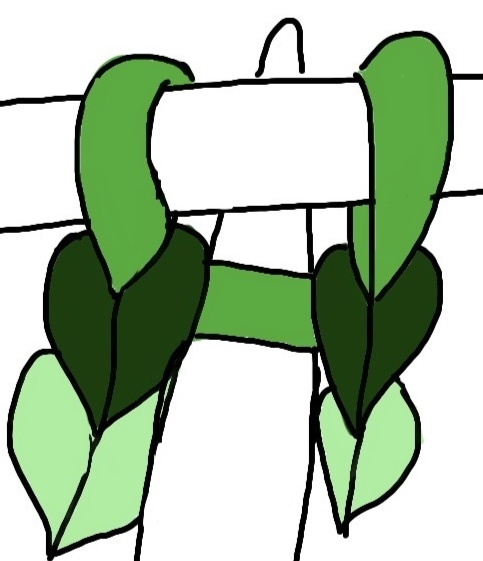 A lark’s head knot is two half hitches in a row, but one half hitch is twisted in the opposite direction from the other, so that they mirror each other. Why not, I thought, mirror the twist in the two YOs for more symmetry? Here are the results of this experimentation. I’m going to call this the lark’s head stitch, though surely someone else must have come up with it and called it something else. This is a case where it matters which order you make the stitches in depending on the effect you want on the front of your work. Both Double YO #4 and 5 above are worked with a lark’s head stitch. The first variation I show will create a horizontal blip on the side of the fabric that is not facing you. The second will create a horizontal blip on the side that’s facing you. Which you work depends on whether you’re knitting in the round or knitting flat, and whether you want a horizontal blip showing or not. Twist and work the first loop as shown above. Now, drop the second loop. Don’t worry! It won’t run; it can’t, since there’s no stitches below it. Now, bring your non-active needle in from behind to pick up the loop again so that it sits on the needle in the opposite direction. Now, either knit or purl the YO leg that’s in front of the needle so that the YO is twisted as you work it. Have fun! Play around! See if this makes you think of something else to try! For the pattern I’m working on, I came up with an interesting decrease that turns out to have been invented more than once already (not really a surprise to me). Please let me know if you find this at all confusing! A stitch from S.F.A. Caulfeild’s Dictionary of Needlework, p. 129, rewritten in modern terms. 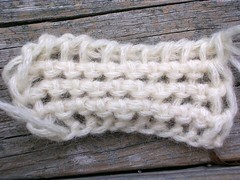 This is a netlike stitch which stretches vertically, but not particularly horizontally. This is a pretty stitch for handkerchiefs, shawls, etc, or as a stripe for a blanket. Cast on a foundation chain the length required. First row–raise all the loops as in Tricot, and work back very loosely. 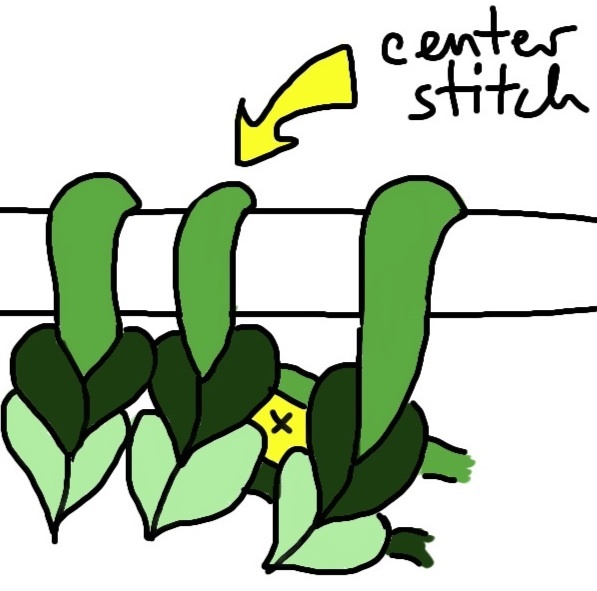 Second, or pattern row–keep the wool to the front of the work, take up the little stitch at the top of the long loop without drawing the wool through, put the hook from teh back of the work between the next two loops, draw the wool through to the back across the long loop, pass the stitch just formed into the one above the long loop without taking the wool on the hook again, take up the next small stitch above a long loop (the wools should be still in front), insert the hook from the back between the next two long loops, draw the wool to the back, and pass this stitch into the last raised, continue to the end, work back in the usual way very loosely, and repeat the second row. Foundation row: Work one row of Tunisian Simple Stitch (TSS) as usual on any number of stitches. Work back as usual, but loosely. *With yarn in front, insert hook into the chain loop directly above the second vertical bar. Do not pull a loop through yet. Now insert the hook from back to front between the second and third vertical bars. Repeat up to the very last stitch, which is worked as TSS. Work back as usual, very loosely. A stitch from S.F.A. Caulfeild’s Dictionary of Needlework, p. 122, rewritten in modern terms. A suitable stitch for couvrepieds when made in thick fleecy wool and with a large No. 8 bone hook, but which does not look well worked with fine cotton. Make a foundation chain of an even number of stitches, work a row of Tricot, and work back. Second row–Work the first stitch plain, and then put wool round the hook, bring it out at front, push the hook through the next two long loops, still keeping the wool before the work, put wool round hook, as shown in Fig. 221, and draw it through the two loops. Put wool again round hook, thus making a stitch for the one lost in the work, and continue to end of row; work last stitch plain. Draw the wool back through the edge stitch, and then through two stitches, as in Tricot. The second row is repeated throughout. Make a chain with an even number of stitches, and work a foundation row of TSS and back. Bring the yarn to the front of the hook, and then over. 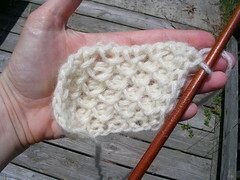 Bring the yarn over the top of the hook again; you should now have wrapped the yarn around the hook twice. 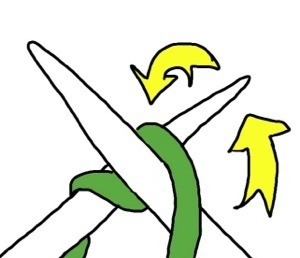 Insert the hook through the next two vertical loops. 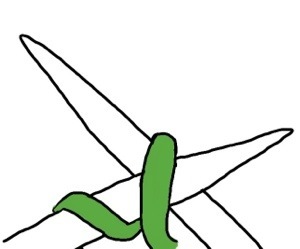 Bring the yarn back to the front so it crosses in front of those two loops. Gently pull a new loop back through the two loops. You now have a total of two new loops on the hook. Repeat the two wraps and purling the two loops together to the end of the row; work the last stitch as usual for TSS. Work back as usual. A stitch from S.F.A. Caulfeild’s Dictionary of Needlework, pp. 130-131, rewritten in modern terms. 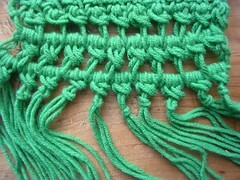 This is an open, netlike stitch with thick horizontal ridges. A handsome raised stitch used for crossovers, petticoats, and comforters. It should be worked in double Berlin or four thread fleecy wool. Make a foundation chain of the width required, and work a row of Tricot, and then back. Second row–work the first stitch plain, then bring the wool in front of the work and put the hook into the hollow between the first and second loop, allow this to catch hold of the wool at the back, the wool passing from the front to the back over the work, bring the hook back again to the front with the wool on it, put it into the hole between the second and third loops, and let it catch the wool, returning with it on the hook, where there will now be three loops for the one stitch, draw the last made loop through the other two (see fig.248), and retain it on the hook. For the next stitch, put the wool forward, and the hook into the same space as before, between the second and third loops, and repeat from * [transcriber’s note: there was no *]. Work the last stitch as the first stitch, and work back in Tricot. Work a row of regular TSS (the most basic stitch in Tunisian crochet), and work back. Bring the yarn forward, in front of the hook. Insert the hook into the space between the first and second stitches, bring the yarn over to the back, and pull a loop through. There are now two new loops on the hook. Insert the hook between the next two stitches, and pull a third loop through. Pull that loop through the previous two loops. 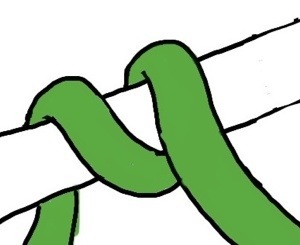 *Yarn forward, insert the hook into the last space you pulled a loop through, and pull another loop through. Insert the hook into the next unworked space, pull a loop through, and pull the same loop through the previous two loops. 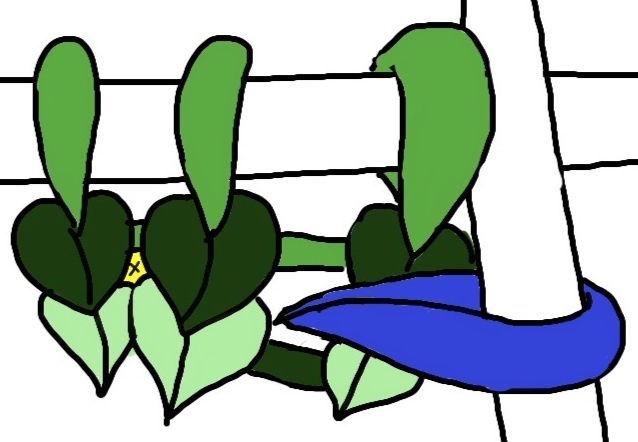 * Work the last stitch as you would for Tunisian Simple Stitch, making sure to not pull it tight, as the Open Raised Tricot stitch grows vertically. A stitch from S.F.A. Caulfeild’s Dictionary of Needlework, p. 130, rewritten in modern terms. This stitch has fewer similarities to knitting than the other Tunisian crochet stitches I’ve tried. It makes a nice mesh. JTS: Insert hook in a stitch, pull a loop through, and chain one. and then pull a loop through the last three stitches on the hook. Start by making a chain the length you want, plus three. the end. Return row as usual. Row 2: Chain 2, then work a JTS in each chain space. Return row as usual. Repeat row 2 as desired. 1 chain instead of 2. Start by making a chain with an even number of stitches, plus one. the first 2 stitches on the hook. * Chain 1.
return row and knot two pieces of yarn through each stitch. I’ve added some free PDFs on the sidebar and will probably add some more over time. These are my write-ups of some of my favorite techniques, ones that I don’t see in common use. Lifted increases look similar to regular decreases. Both left and right lifted increases are possible, mirroring left-leaning and right-leaning decreases. The disappearing loop cast-on is useful for starting any knitting you work from the center outward, like doilies, some shawls, and hats or mittens knit from the top down. Links go to Google Docs; the PDFs look better in a different viewer.